Hydro Dynamic shape for underwater vehicle. Rotary Switch, diver operated, on-off, 2 position, hydrodynamically shaped to the vehicle’s curvature. 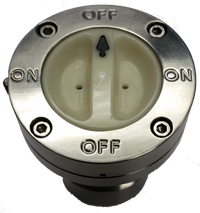 Contact rating: Switching voltage: 230 VDC/VAC max.Switching current: 3.0 AMPS max.Switching capacity: 60 W/VA max.Carrying current: 4.0 AMPS max. Operation: All 4 switches on in “ON” positions,all 4 switches off in “OFF” positions. Magnet coupled, no dynamic seals. Thru bulkhead design with dual static o-rings. Wet side is submersible to 1,000 ft ocean depth. Weight: 40 oz. S.S. or 28 oz. Alum.